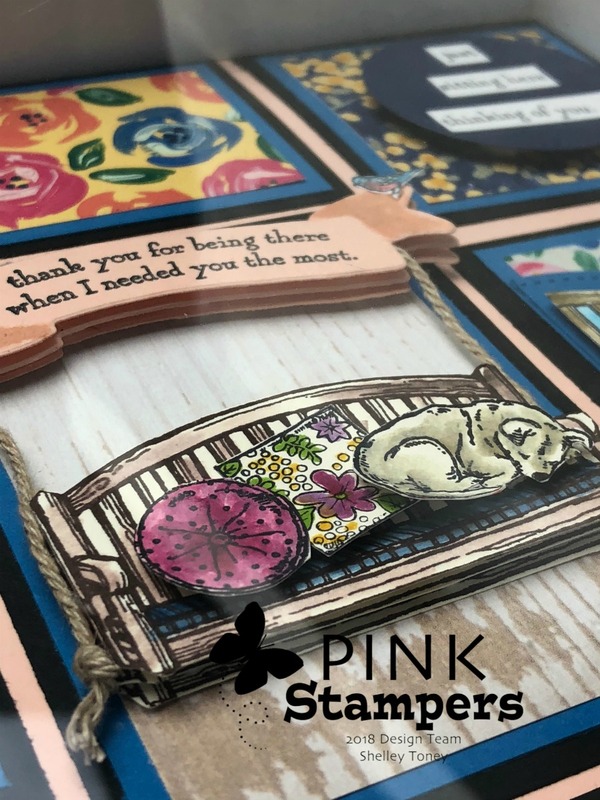 Sitting Here is a stamp set that I showed quite some time ago, but as part of the Pink Stamper Design Team, I had the opportunity recently to work with it again. It was so fun to pull it out and see what else I could do to make my projects a little different than I did last time. 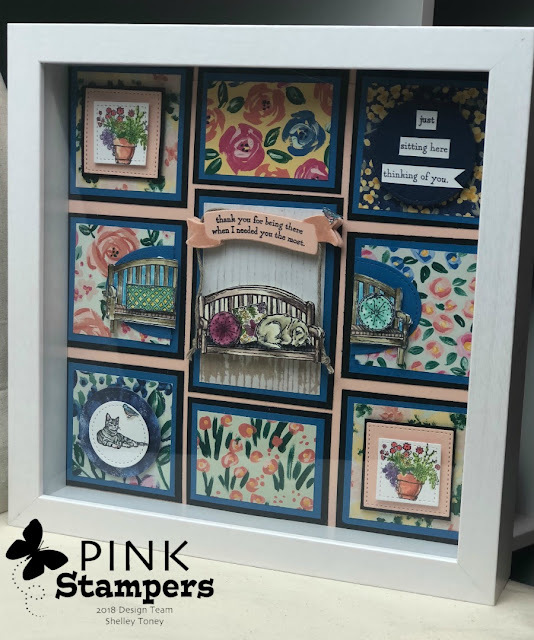 I had a lot of fun making this shadow box. I have wanted to do a sampler for quite some time, but felt a bit daunted with the task. I knew that I wanted to attempt one while I was still on the design team too, so decided this would be the stamp set I would do it with. I hope you like it. Because the shadow box I placed it in, is quite deep, I knew I wanted to add some dimension to my project. 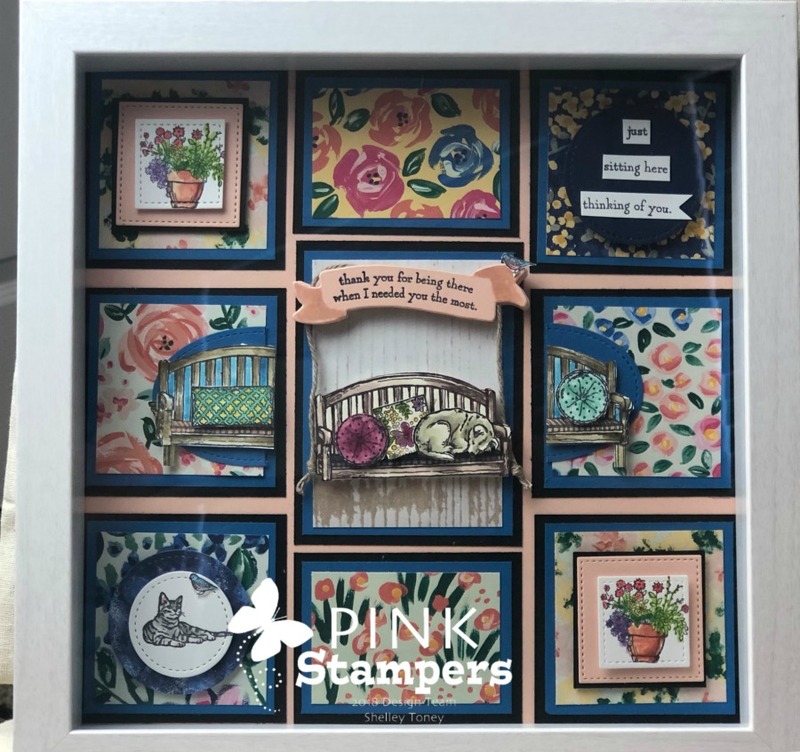 I stamped and cut out multiples of the same image and layering it with Stampin’ Dimensionals gave it that depth I was hoping for. I also allowed my swing to actually be a real swing as the center focal point. I added some of the new Nature’s Twine as my swing ropes. And, my swing actually swings back and forth. (Not that it needs to!). I once again used the Garden Impressions designer series papers for this project because they really are the perfect paper for this stamp set. I plan on gifting this to a friend that will be retiring next week. I am going to miss her a lot at work and hope that when she looks at this, she will remember me Kindly. I have some more projects to share from this stamp set and will post them later this week. Please come back to visit!